This project has been great for me. It has given me something to focus on other than the stress of trying to find work, provides a routine for my day, offers an opportunity to learn new things, and most importantly, it has me writing almost every day. The bad thing about this project: it hasn’t been good for my waistline. So I decided I needed a goal to help get me back in shape and to curb some of the side effects of cooking recipes from a box that is made up of 60% desserts. And since I found such great inspiration from a recipe box that was discovered at an antique show, I decided to turn to another item I picked up about year ago at an antique store. It, like the recipe box, haunted me. There was something I was meant to do with it, but for the past year it has been sitting on my art project table just staring at me. One of my dreams is to travel to Europe. I want to wander through the lands that once gave William Shakespeare his inspiration. I want to spend days staring at priceless works of art in the Louvre. I want to drink a pint of Guinness in Ireland with my husband (even though I can’t stand the stuff, he swears there’s nothing better). I finally got a passport, but then I lost my job and my husband’s company had layoffs so we put our lives on hold. But I still stare at this picture and dream of what those ancient rocks would feel like beneath my fingers. I Googled the name at the bottom of the print and actually found a photograph online that was taken at nearly the exact same spot as this one. It was fun to see it in color and made me want to be there even more. 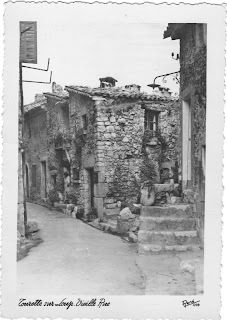 And then it clicked – I would run to Tourettes Sur Loup, France. Well, not literally. I found a site that calculated the distance in miles between Minneapolis, MN and Nice, France (it is just outside of Tourettes Sur Loup): 4,622 miles. I’m not sure how accurate the mileage is because it used the path an airplane would take, but it’s close enough. I used to be an avid runner. Before I moved to Minneapolis I ran 6 miles a day 3-4 times a week. When I moved, I fell out of my routine and then suffered a back injury that made me inactive for a couple of years. Even once I was able to move around again, I was so terrified of re-injuring myself that I erred on the side of caution and stayed inactive. A physical therapist once told me that I’d never run again. It was one of the most depressing days of my life. Recently I tried running, just short distances to test my back’s durability. Ironically, I felt better than I have in years. Since my back injury, I have not been able to lay flat on my back. Once I started running again, I was able to actually sleep on my back for hours at a time. I’m not sure if I’ll be able to run the way I used to, but just to be able to run one mile feels pretty damn good. I broke down the mileage of the journey from Minneapolis to Nice and it equals about 13 miles every day for 1 year. That’s not going to happen. I wanted to give myself a chance to actually finish this so I’ve decided that running, walking and biking miles will all count towards my goal. I’ll put a counter on the side of my blog so you can watch the mileage add up. I figure I have a better chance of actually sticking to this if I know someone else is tracking my mileage too. I hope that by the time I reach this goal, I’ll actually be able to travel to Europe. I’d like to go to Sweden and try real Swedish pancakes. There’s a recipe in the box for a German cookie called a Springerle, which requires a special rolling pin etched in decorations. I’ve been looking for them online, but wouldn’t it be fun to get one from Germany, maybe from someone who could share a story about a Springerle tradition in their family? Hopefully someday the Found Recipe Box will have a chance to go global, but for now I have a wooden box and a picture of a small town in southern France to help me stay focused on my goals and give me something to look forward to. I’ve been through a lot over the past few years and somehow I came through to the other side not completely recognizing the person I’d become. There are two activities, however, that always bring me back to myself: writing and running. And this amazing little box has brought them both back into my life. It’s sad when we abandon the things we love most during difficult times. One of my favorite inspiring quotes is from the movie Mr. Magorium’s Wonder Emporium: “Your life is an occasion. Rise to it.” I have taped this quote to the front of the Found Recipe Box as a reminder to never abandon the things that make me “me.” Lately I have felt like Molly Mahoney from Mr. Magorium’s Wonder Emporium when she was given the block of wood and told to find the magic in it. It’s not the wood we both ended up finding the magic in, it was within ourselves. It’s always there inside of us; sometimes we just need something – like a block of wood – to remind us to look for it. It was great to read your post today! Isn't it fun to find ourselves in such unexpected places? Looking forward to seeing you at the Visual Journal Collective.....maybe your recipe box will accompany you? I'd love to see it in person. I love your ideas, Molly! So creative and inspirational! I'm looking forward to more updates on your journey! !